Cute right? 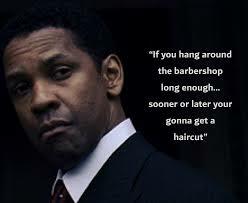 Denzel had to hang around plenty of shops before he got his. One thing that scared him professionally was he couldn’t sing. He failed many times while waiting for that haircut, and then it happened. Famous baseball player Reggie Jackson struck out 2600 times during his career. In fact, he amassed the most strikeouts in the history of baseball. Jackson also hit 563 home runs during his career and was inducted into the Baseball Hall of Fame. Following in the footsteps of The Babe, he also had a candy bar named after him in 1978. This year, I visited the Edison & Ford Winter Estates in Fort Meyers, Florida. I still find it hard to believe that Thomas Edison actually made one thousand light bulbs before one actually worked. Edison said every failure brought him closer to success. Obviously, he wasn’t afraid of being called ‘stupid’ because isn’t that what we’re afraid people will call us? Maybe that’s where the ‘fake it until you make it’ came from. The key is to get over being stupid, obviously stupid is a good thing. Wow, what an attitude. Edison spent his entire life trying to synthesize rubber. He imported plants and trees from all over the world before finding one that was capable of producing the needed product. By the way, I don’t think he ever got a haircut. I watched Denzel Washington give his commencement address to the 2017 Penn State graduating class. Denzel said there was nothing as frightening as giving that speech; he had never seen so many people watch him. Most watch him in his movies when he’s not in the audience. The message, of course, is that we will all fail. And every time we fail, we will be closer to success. This is a great message for all of us. Seth Godin wrote a wonderful book entitled, “What to do when it’s Your Turn—and it’s Always Your Turn.” If it’s easy and fun and guaranteed to work of course you can do it. How often do you say yes or do you spend so much time thinking your turn is gone? How many times have you thought about going to a movie but didn’t go because the coming attraction didn’t appeal to you? We want reassurance that the movie will be good before we go. If you are willing to always be ‘up’ for your turn you will have your opportunity to make a change in this world and to realize your true potential. Lisbeth Calandrino has been coaching business owners and salespeople for over 20 years. For more info. on Lisbeth, check out her web site, lisbethcalandrino.com, or email her at Lcalandrino@nycap.rr.com.